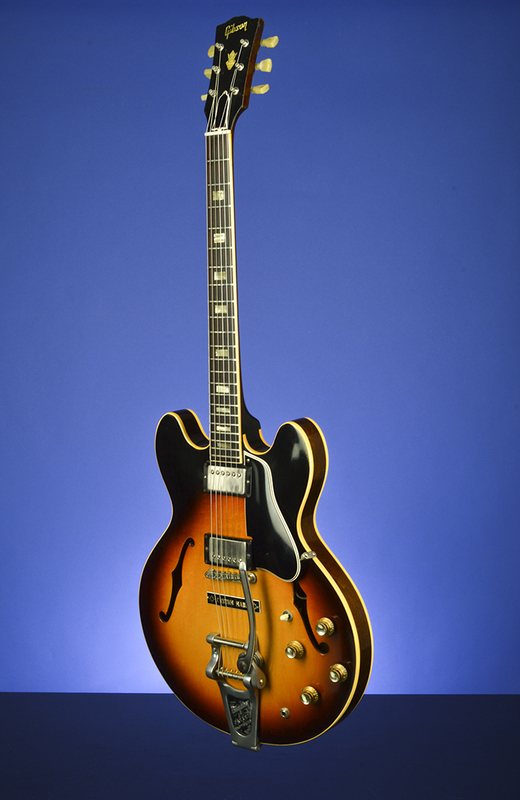 ES-335TD Custom Factory Bigsby Guitars | Fretted Americana Inc.
1965 Gibson ES-335TD Custom Factory Bigsby. 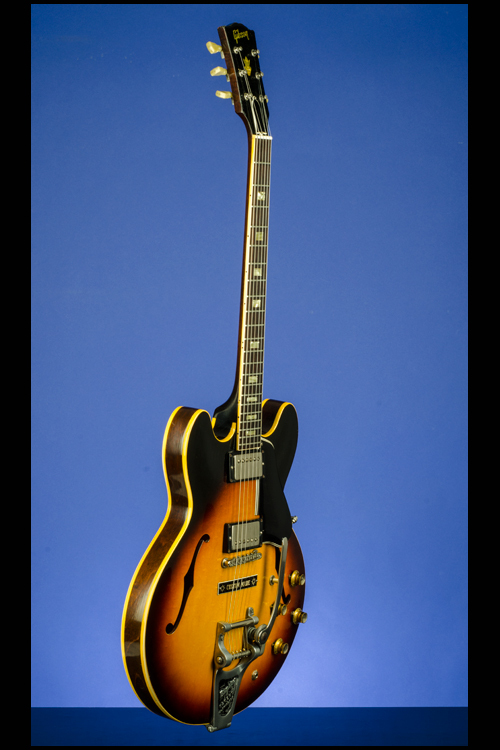 This 16-inch-wide semi-hollow body guitar, with a solid maple block running lengthwise down the center, weighs 8.90 lbs. Laminated maple body with single binding on the top and back edges. 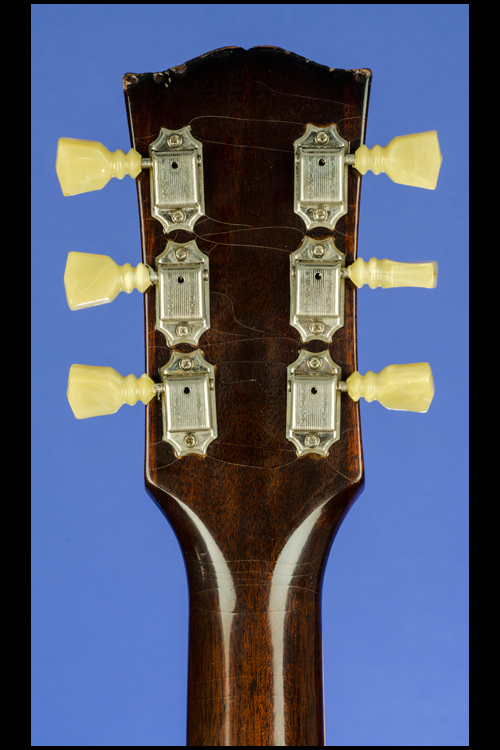 One-piece mahogany neck with a nut width of just under 1 11/16 inches, a standard Gibson scale length of 24 3/4 inches and a typical wonderful medium thick '64 profile. Bound Brazilian rosewood fretboard with 22 original jumbo frets and inlaid pearl block position markers. 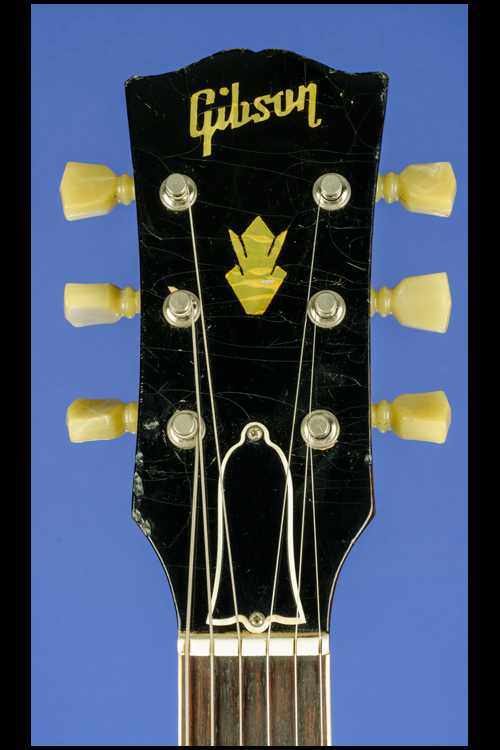 Headstock with inlaid pearl "Gibson" logo and pearl crown inlay. Two-layer black over white plastic, bell-shaped truss-rod cover secured by two screws. Serial number "263181" impressed into the back of the headstock. Individual double-line Kluson Deluxe tuners with double-ring Keystone plastic buttons, each stamped "D-169400 / Patent No." on the underside. Two "patent-number" humbucker pickups with outputs of 7.25k and 7.54k. Each pickup with a small rectangular black label on the underside with "Patent No. 2,737,842". Five-layer black over white plastic pickguard with beveled edges. Four controls (two volume, two tone) plus three-way pickup selector switch, all on lower treble bout. Black plastic bell-shaped knobs with white markings and metal tops. ABR-1 Tune-O-Matic retainer bridge with metal saddles and special custom-ordered factory Bigsby tailpiece. Rectangular three-layer, black over white plastic cover engraved in white "Custom Made" and secured by two screws covering the 'unused' stud-tailpiece screw holes. Oval orange label inside the bass f-hole with the style "ES-335TD" and serial number "263181" stamped in black. There is some very light finish checking and some very minor belt-buckle scarring on the back (nothing through the finish). There are a few minor and insignificant surface marks on the body. There are a few small surface chips on the back of the neck, the most noticeable being a 3/8 x 1/4 surface chip just behind the eighth fret and some checking and minor edge wear to the headstock face. 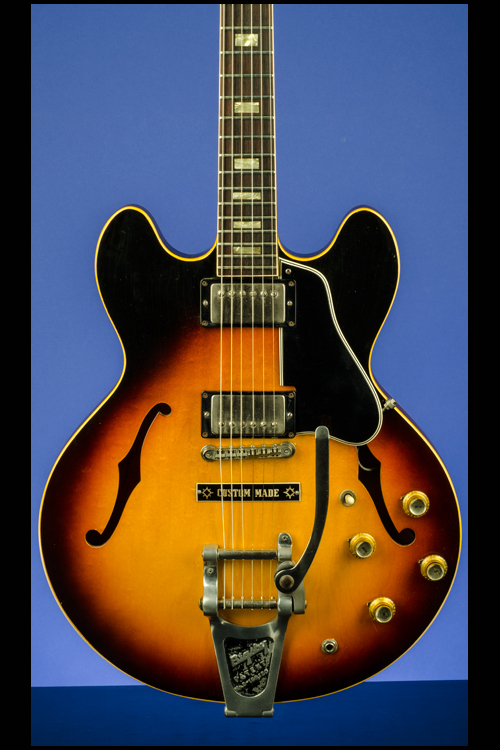 With all that said this spectacular guitar, one of the very last of the great 335s, is in exceptionally fine (9.00) condition. 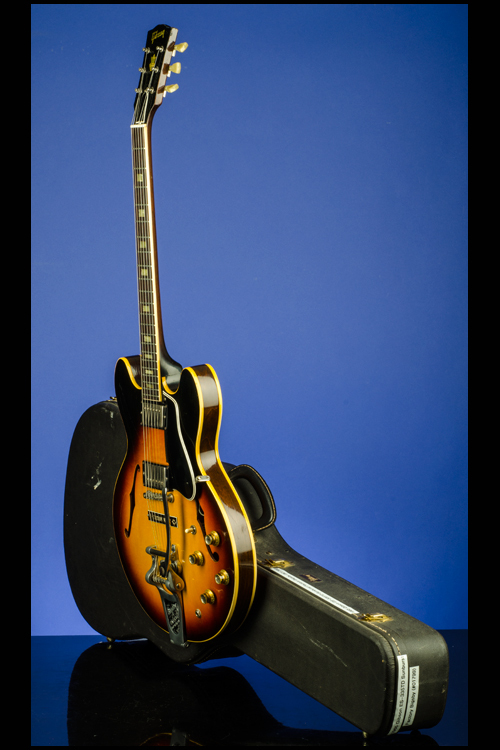 Housed in its original Gibson black hardshell case with four latches and orange plush lining (9.00). 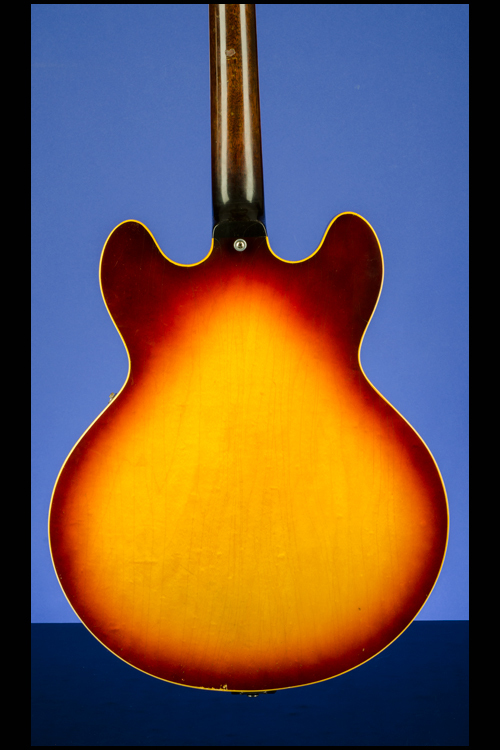 Although this is a very early 1965 example it has all of the features and specifications of the legendary 1964 model including the wider nut width, wonderful medium-to-thick neck profile and nickel hardware. 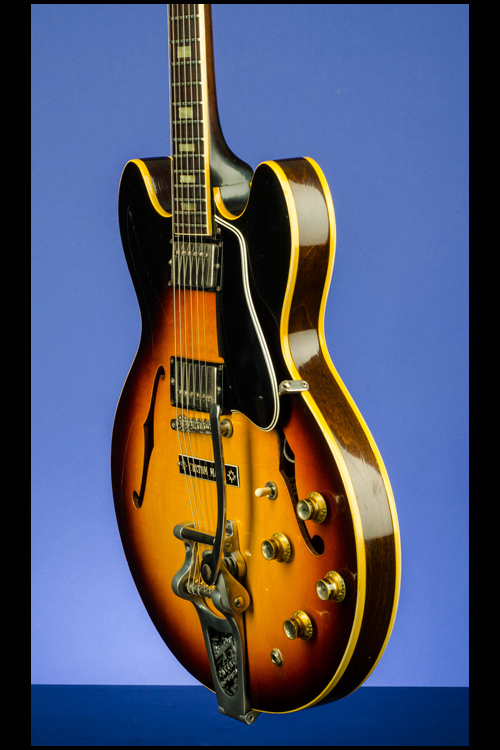 Factory Bigsby examples are highly desirable and this is an exceptional example. 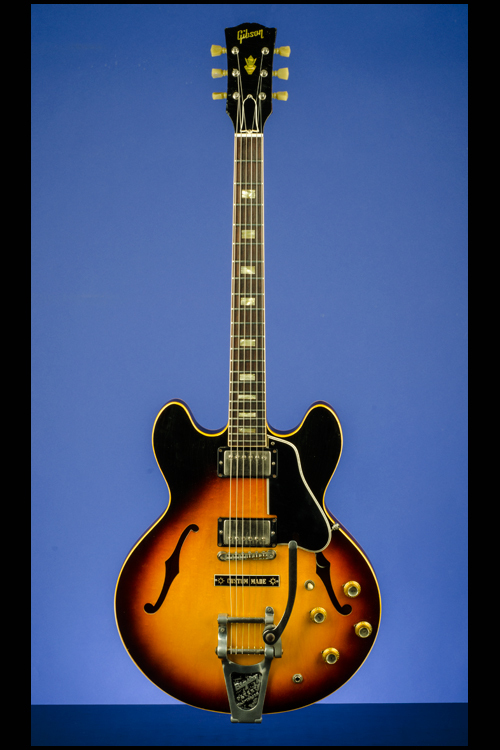 "Introduced in 1958, the ES-335T (originally no final D) truly ranks among the all-time Gibson classics, not only because of its enduring popularity but also because of its semi-solid construction which pioneered a new style of electrics" (A.R. Duchossoir, Gibson Electrics -- The Classic Years, p. 231). "There were indeed a number of firsts in the early days of the electric guitar, but in retrospect only few of them can be considered as true milestones. 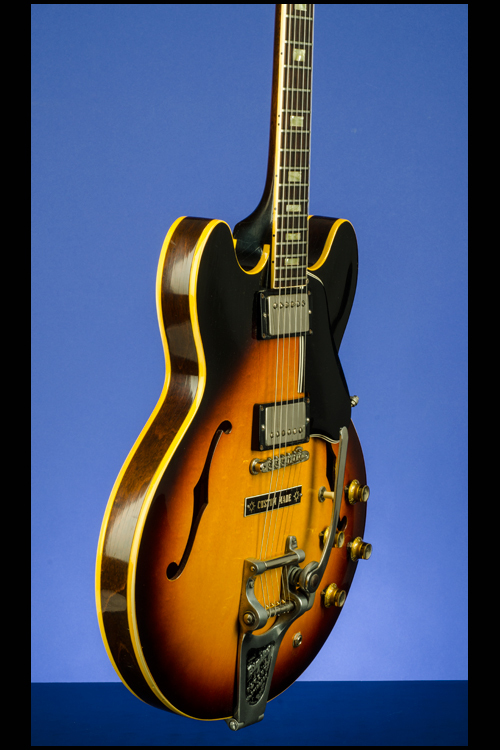 The double cutaway thinlines pioneered by Gibson in 1958 genuinely rank amongst the great original designs. 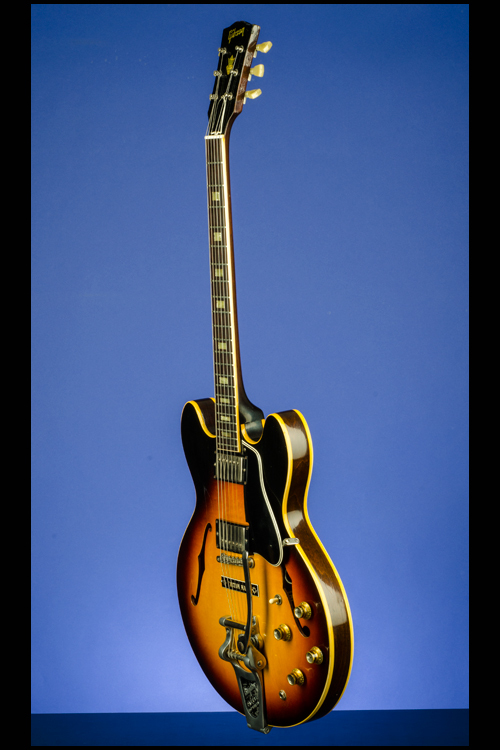 Their graceful shape was truly innovative at the time and spawned several imitations such as Gretsch's revamped Chet Atkins series or the Guild Starfire. 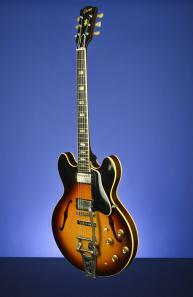 But perhaps the most important hallmark of the new thinline was their semi-solid construction. 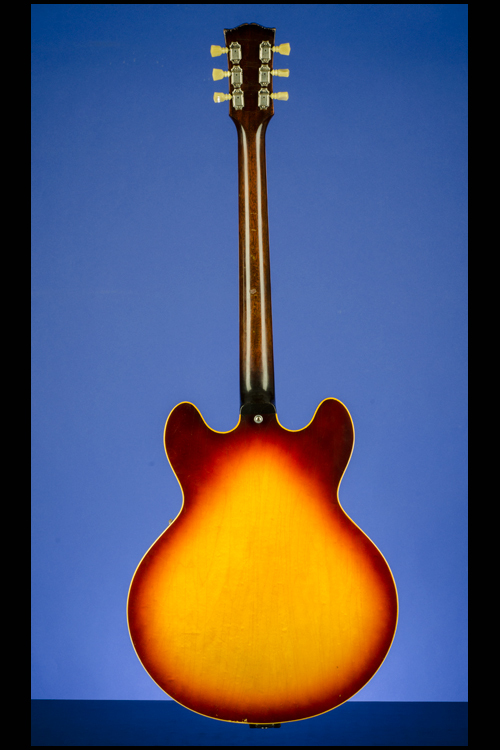 Indeed Gibson's prime objective was to design an instrument that would combine the advantages of both solid and hollow body electrics and therefore appeal to a variety of players, regardless of their musical style" (A.R. Duchossoir, Gibson Electrics -- The Classic Years, p. 77). Killed it again! His thumb must be one of the hardest skinned mother f...s going!